Feast, Pray, Love are three words that best describe what my life is all about…I celebrate through feasting and when I pray, it isn’t with a long list of things I need or want, it’s to be thankful…taking time to count every one of my blessings which makes me love life more everyday. Love…the most beautiful gift of all, what would life be without those we love and treasure! Whether I am working, doing a show, or just being with my family…I feast, I pray and I love fiercely! The idea of putting together the ‘FPL’ section to my blog has been on my mind for ages, like coffee…my ideas keep percolating! 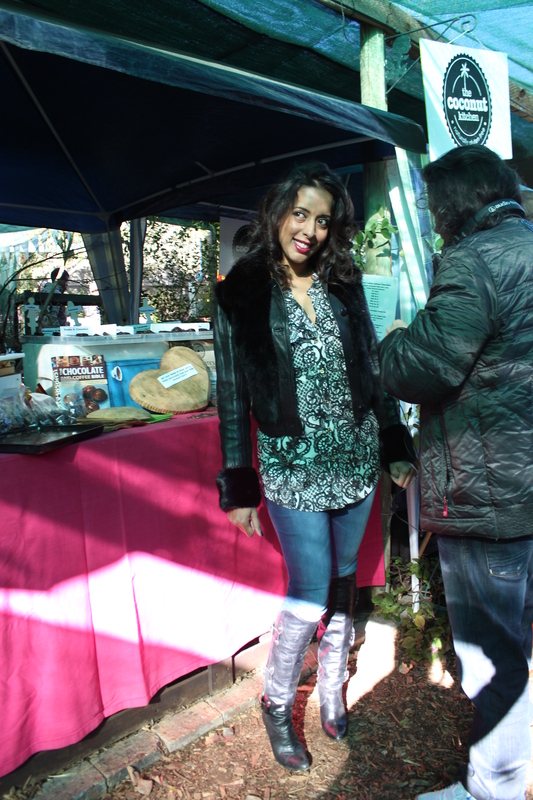 Through my journey, highs and lows….I am learning to be kind to myself and forgiving too. I love to travel, see new places and experience different cultures…on the 15th May this year, just a stroke past midnight, I was tapped lightly on my shoulder by an air hostess on SAA, waking me up to my birthday and a bottle of Taittinger Rose…it was a toast to new beginnings and what better way to kick off a new year with an adventure in London…with an exciting new project on the cards, the city was my oyster. I threw back my champagne and fell into the most delicious sleep. 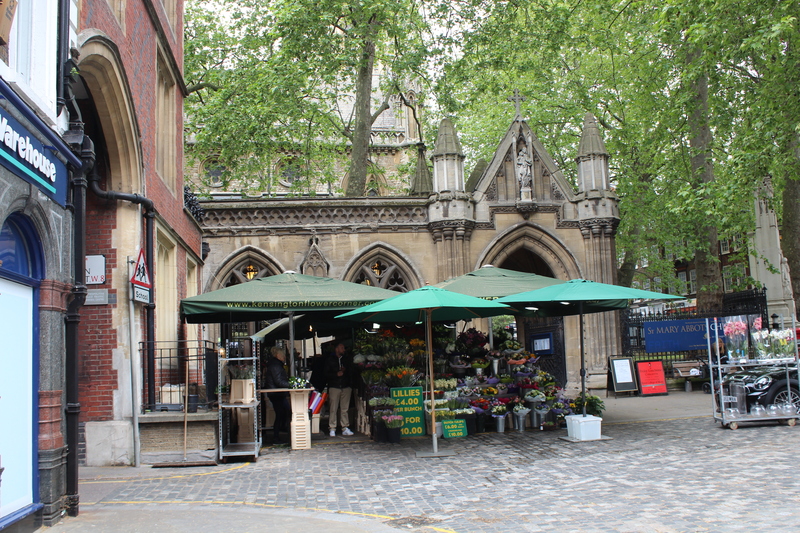 I had a bit of free time and took a walk down Kensington’s High Street which led me to a little pocket of Iranian supermarkets, green grocers and restaurants. I love Iranian food and Jozi seems to have lost Apadana, the only place I knew that made a good Fesenjun…which is chicken cooked in pomegranate molasses and walnuts. 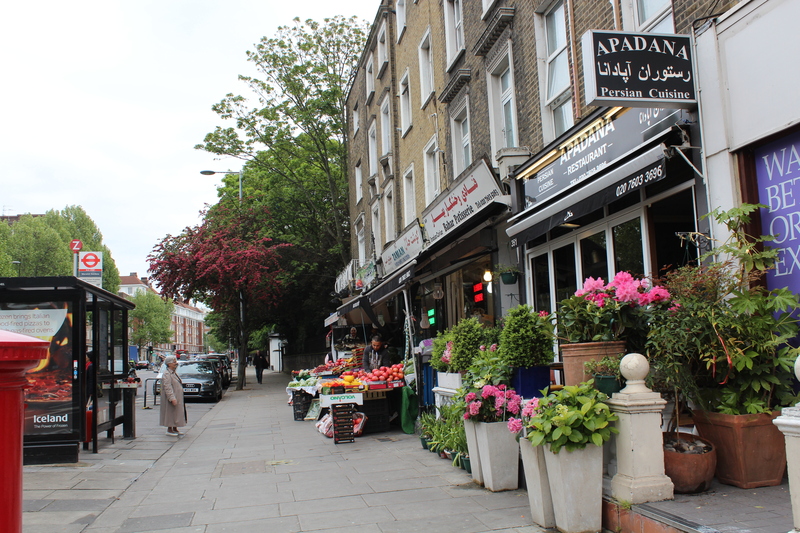 There is also an Apadana restaurant in Kensington. 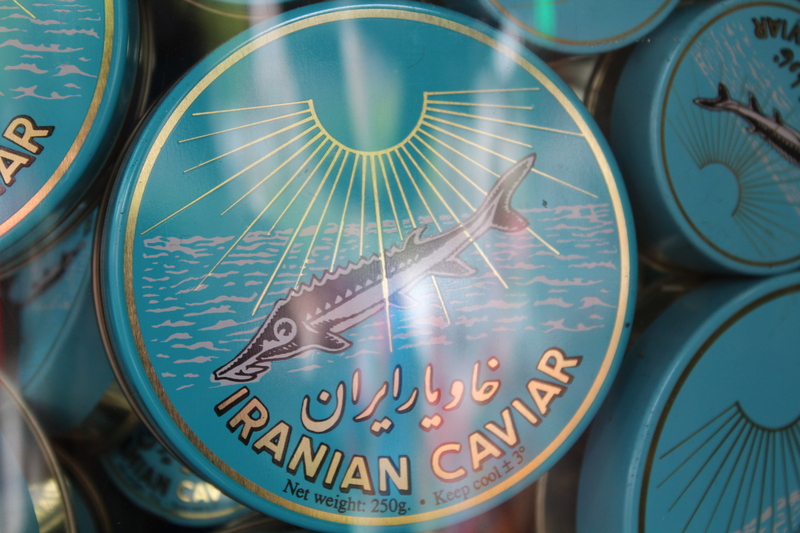 I popped into Zaman, the Iranian Supermarket…the store is crammed with everything from fresh and dried fruit, Persian sweets like cashew nut baklava, macaroons and something that looks like Indian jalebi to Iranian caviar…and spices. The Iranian community are pedantic about the quality of dried fruit, nuts and the saffron is fabulous. 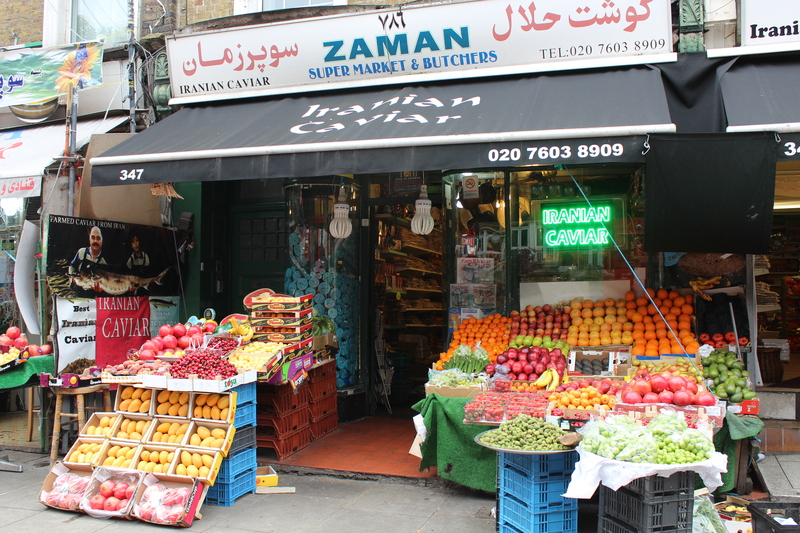 The Iranian stores seem to be more like old-fashioned family run businesses. 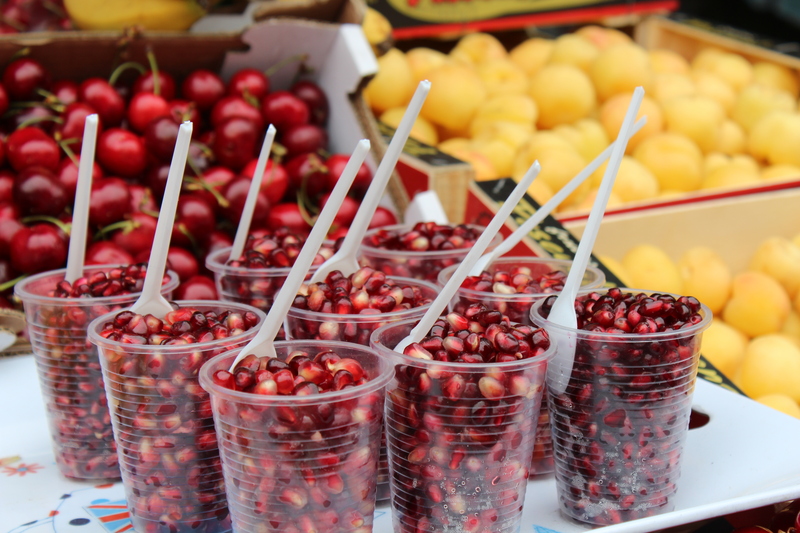 The fresh fruit display outside the store is inviting, colourful and very old school….bright pomegranate rubies are sold in little cups which make the perfect walkabout snack. 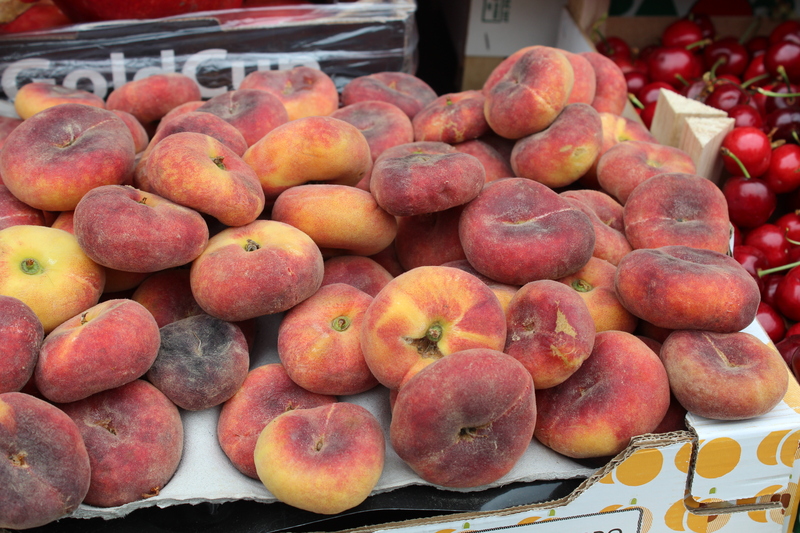 There are also persian peaches, glossy deep coloured cherries, fresh herbs and veggies. 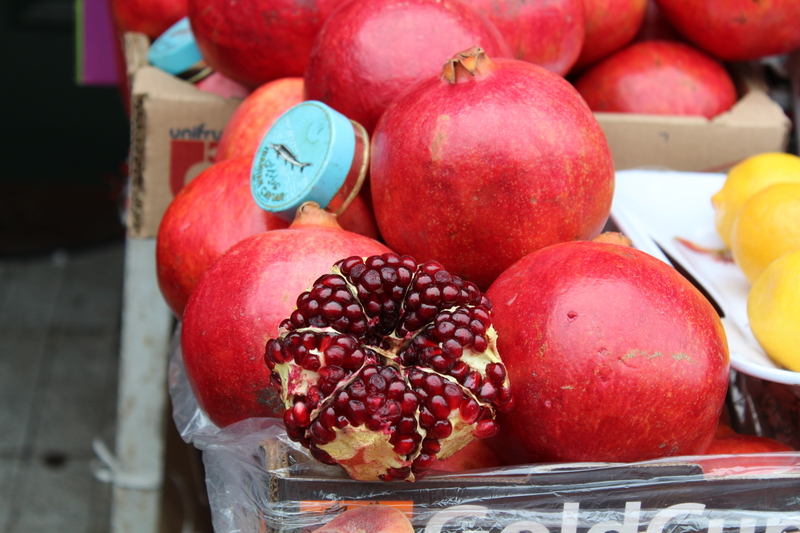 For a Persian experience outside Iran, I recommend taking a stroll through this part of Kensington, it’s not only a feast for food explorers but for the eyes too! I have been working on recipes for the Post Newspaper’s with Ramadan in mind and it’s the perfect opportunity to splash out with my saffron…here is my version of a Persian dish called Koresht-e-Mast which is chicken cooked with yoghurt and saffron. 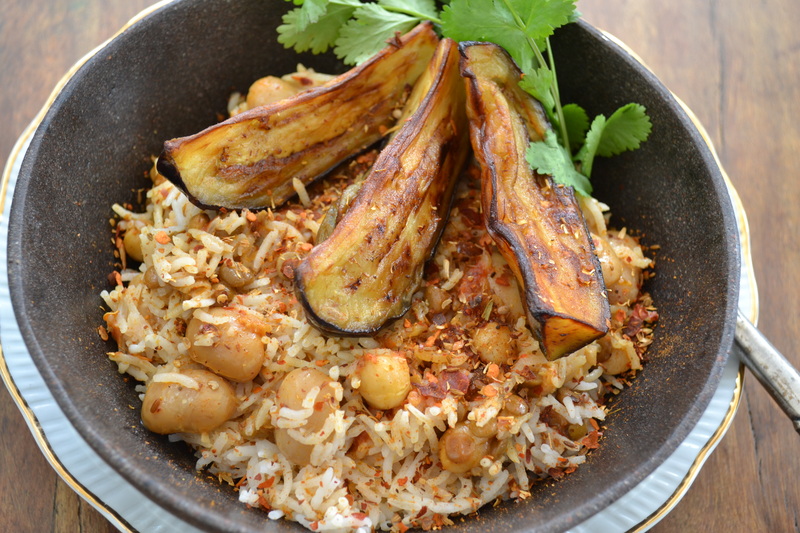 How can I best describe this dish…it’s almost a curry and also described as a Persian stew…a stew??? This is way too exotic and fragrant to be compared to stew…cumin, coriander, red chilli, teamed with fresh orange juice and finished with yoghurt. 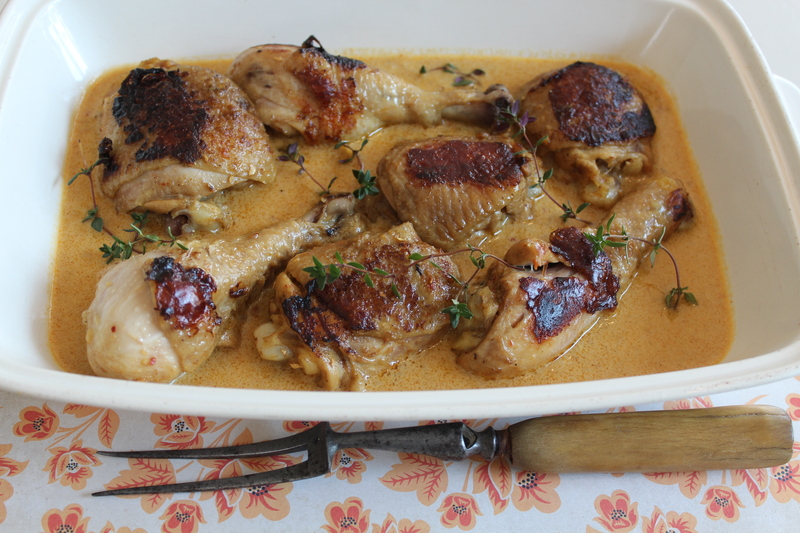 The dish is lightly spiced, aromatic and creamy. I used the Spar branded double thick yoghurt for this recipe as I find this one doesn’t split or curdle. Heat the saffron strands in a dry pan or microwave for a few seconds. Crush the saffron using your fingertips and place in a little bowl. Pour the boiled water over the saffron and leave aside to infuse. Heat the sunflower oil in a 30cm AMC Gourmet Roaster. Add the bay leaf and fry until fragrant. Add the sliced onions with the salt and saute until pale golden in colour. Stir the celery sticks into the fried onion and saute until they soften. Add the crushed ginger and garlic. Place the chicken into the fried onion and stir well to coat. Sprinkle the red chilli, ground cumin, coriander and cardamom over the chicken pieces. Stir well to coat, pour in the boiled water and crumble the stock cubes into the pot. Pour in the orange juice, add the fresh sprigs of thyme and saffron liquid. Lower the heat and simmer until the chicken is tender. Remove the chicken from the pan. Heat an AMC 28cm Chef’s Pan and grease with non stick spray. Place the cooked chicken in the pan with the skin side down, turning them often to ensure they brown evenly. Remove from the pan once they are golden brown. Whisk the yoghurt with egg and water. Important step: Remove the pan from the heat and gradually add the yoghurt mixture while whisking the sauce continuously – this prevents the sauce from splitting. 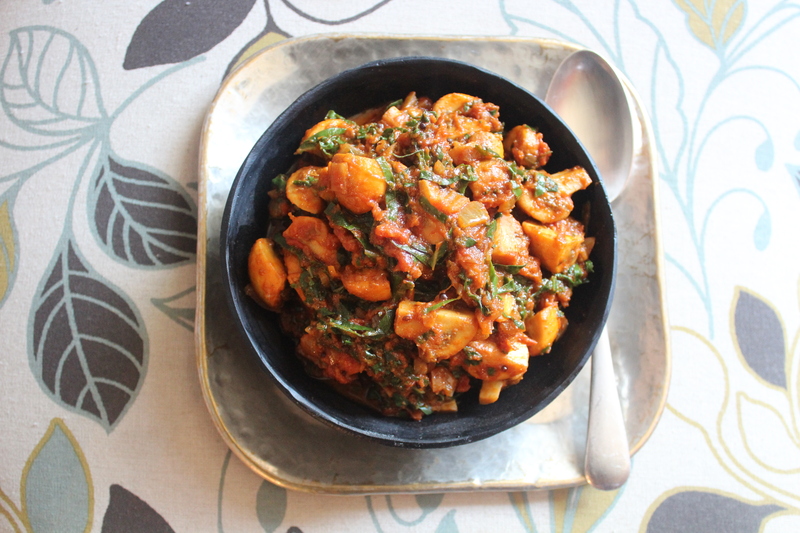 Add the Magic Masala – if you have some! Simmer on low until the sauce thickens and then return the brown chicken to the pot. Once the chicken heats through, season with black pepper and garnish with fresh thyme. Serve with steamed basmati or pilau rice. This is how I roll…Rocking the Roti! Every culture, every society, every country has superstitions. Whether we believe them or not, they play some part in our everyday lives. Some of them are based on religion, some based on folk legends but if you are Indian, there are more than a few superstitions about roti and most of them are about finding a husband or keeping your mother in law happy. 1.The roti dough always needs to be made by hand and not a mixer – shows your mother in law that you are capable and if you do use an electric mixer, you will always have hard roti, not to mention the embarrassment and shame your mother will have to live with. 2. I used to cut out my roti using an AMC pot lid to save my mother the social embarrassment of having rather odd-shaped roti served at the table. I was told that this would also make the roti hard and biscuity…how??? Is there a scientific reason? Mrs Anne Bramdeo, who is just so dear to me convinced me that I needed to break my pot lid habit and gave me some lessons. The pot lid is now used for the rightful purpose. 3. It is bad luck to take the ‘roti pan’ off the heat while you are cooking them…you should cook off the roti without commercial breaks…in today’s world that means you don’t have time for selfies! 4. The first roti should never be eaten…it is for the birds! I say it is for the Mother in Law! The first roti is much like the first pancake, it never turns out right. 5. ‘Save the last roti’…I always got busted for this. Apparently, the last roti was saved to ‘save the family’ from starving but also in case God visited. Why waste a perfectly good roti? In the shloks or religious verses, it states ‘Treat your guests as God’ and if there was an unexpected guest, they should have at least one roti. I would happily cook up a batch at anytime, a fresh roti is a delicious treat. 6. 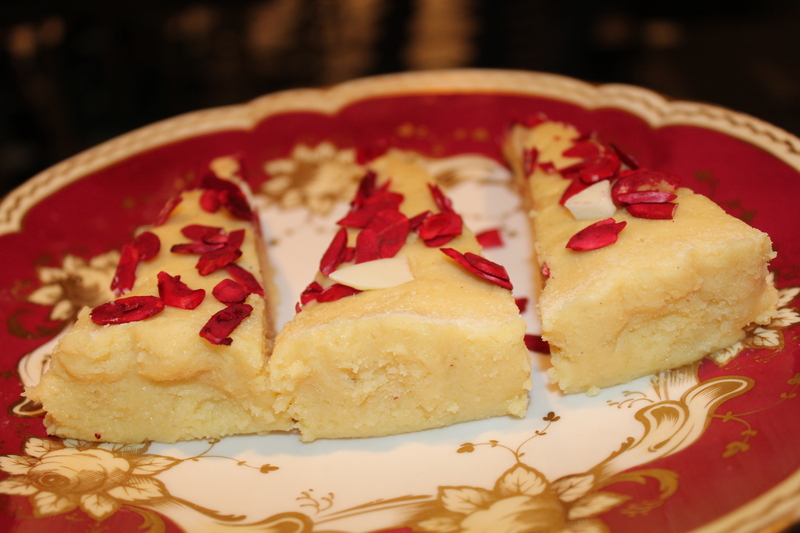 If the roti puffs up, your mother in law is going to love you…I can safely say that this one is just a con to get women trying harder at roti…mine puff beautifully and I can swear there isn’t a loving mother in law in sight! I have had two, the first was never the loving type but the second….tjo tjo tjo! We all have those stories, don’t we? 7. If you don’t make good roti, you won’t find a husband…I know women who have no desire to make two minute noodles, but have found amazing husbands, women who laugh about their flying saucer style roti, wonky rotis, dry ones and maps of Africa. 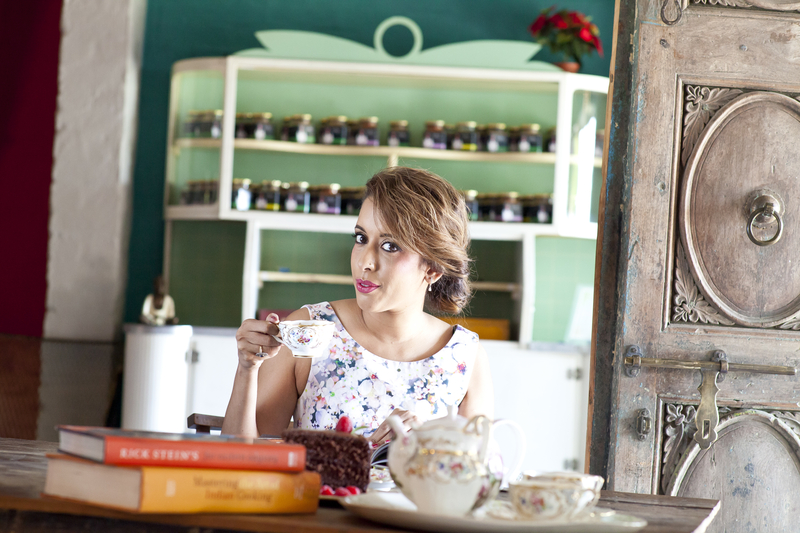 I am going to be bold and brave, declaring that none of these superstitions ring true in my case, that is….I make a pretty mean roti, haven’t found lasting love, a loving mother in law or an amazing husband but I am having the time of my life! Roti superstitions were craftily conjured to keep women in the kitchen and trying harder! If you have any roti superstitions, please share them in the comments section…I am sure I missed a few! While you are visiting this blog site, click follow to get the recipes sent to you via email. The first attempt can always be a bit of a disaster…remember it only gets better each time you try. Every batch becomes less messy and your ‘roti lap time’ improves! 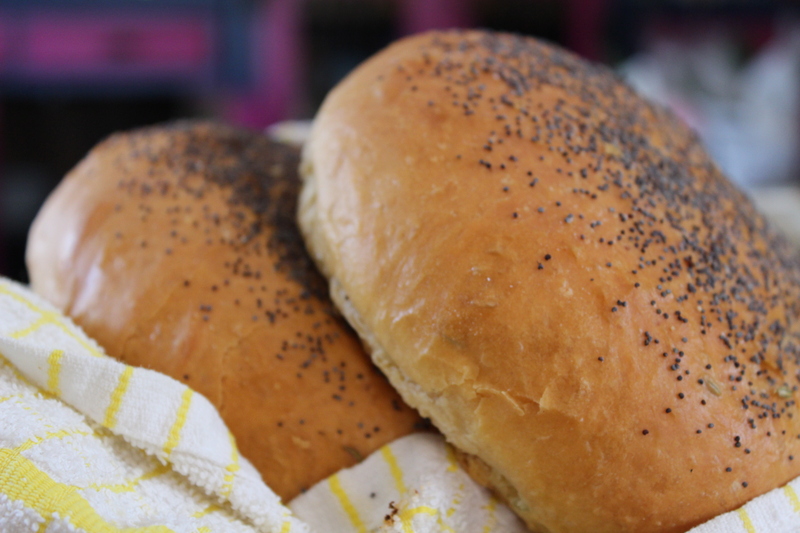 Here is my simple recipe, but before you get started here are 3 tips to remember! Make sure the boiled water is not recently boiled or left to cool slightly, it needs to be bubbling when poured into the flour. I use sunflower oil instead of butter, as this keeps the roti softer for longer. Butter gives the roti a more shortcrust like texture. 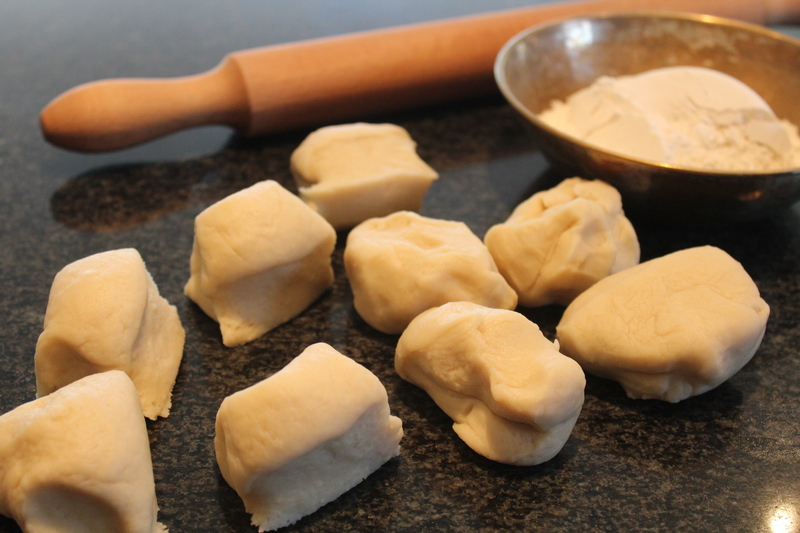 Work quickly with bringing the dough together, this makes it much easier. Place the flour and salt in a mixing bowl. Pour the boiled water over the dry ingredients. Mix the water into the flour. Add the sunflower oil and knead the dough until smooth. Roll the dough into a ‘log’ and slice into 12 pieces. Roll each piece into a length and curl up half . Curl up the other half in the opposite direction. 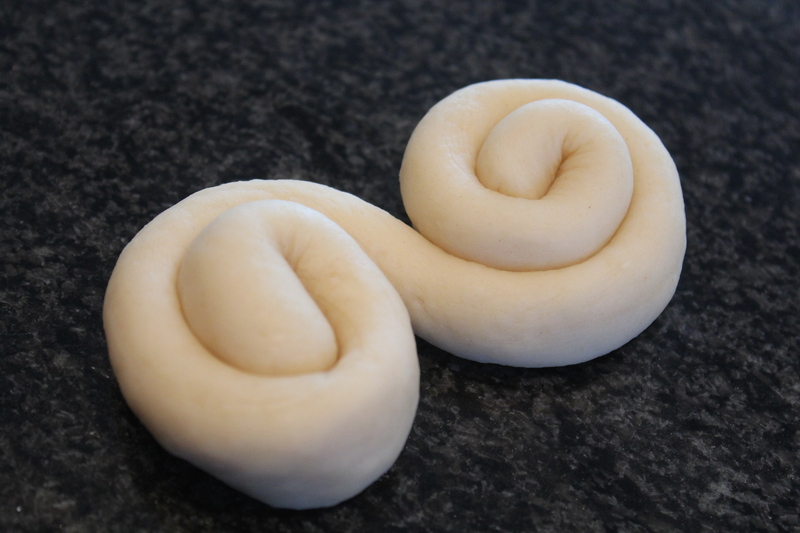 Fold one curled section over the other and flatten the dough slightly. Cover the dough with a damp cloth. 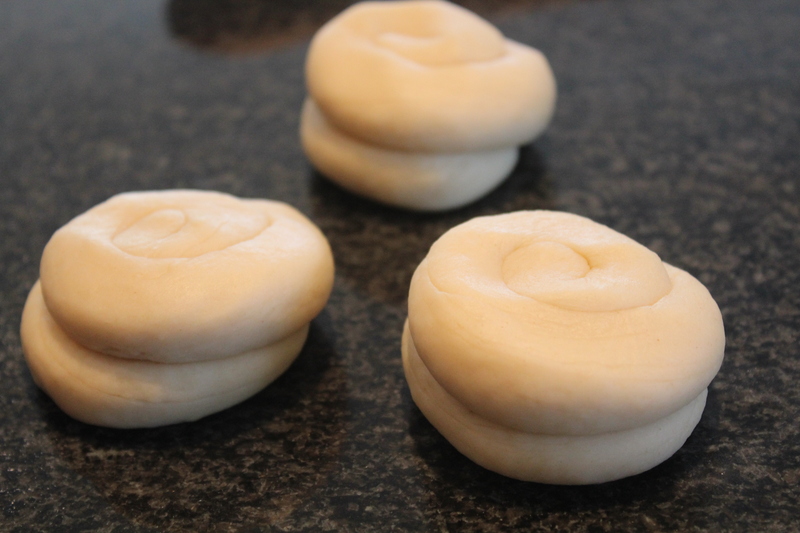 Roll each piece into a round ensuring that the work surface is dusted with flour. Repeat until all the dough has been rolled out. Place the roti on a hot pan, when small bubbles appear, flip the roti over. Drizzle with melted butter, then flip the roti again, drizzle again and then flip the roti. Brown the roti, and remove from the pan. Pile the rotis and leave to cool before storing them away. 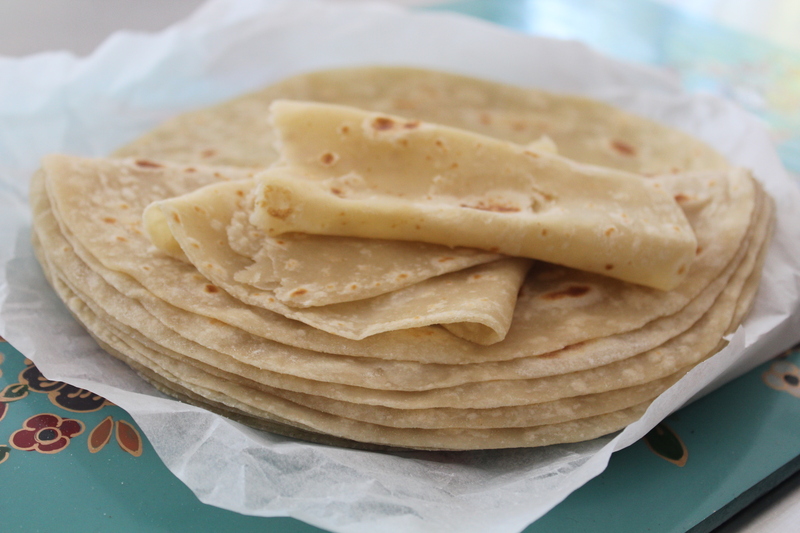 Store rotis in a cake tin lined with wax paper. Reheat in a microwave for 10 – 20 seconds. Flavor the dough with 2,5ml cumin seeds. Another Meatless Monday…and today is also World No Meat Day! This is a quick and easy recipe that is absolutely delicious. You can serve it as a meal on it’s own or as a side dish. Mushrooms taste better when cooked in advance and absorb the spices from the sauce. Prepare the mushrooms and add the spinach just before serving, taking care not to over cook it. Heat the sunflower oil in an AMC Paella Pan. Add the mustard seeds and when the pop, add the cumin seeds. Add the chopped onion and salt. Saute until the onion is golden brown. Add the crushed garlic and fry for a few seconds. Stir the red chilli powder and mix for 5 seconds. Add the chopped tomatoes and stir in the remaining spices. Add the ground cumin, coriander and turmeric. Simmer the sauce and use the back of a spoon to break down the lumps. Once the sauce resembles tomato paste, add the chopped mushrooms. Simmer until the mushrooms soften, add 125ml boiling water if the sauce is too thick. Once the mushrooms are cooked through, add the chopped spinach and simmer uncover for a minute or two. Garnish with fresh curry leaves and coriander. Life can be many things but for me it’s a peach….It isn’t always the case but sometimes we can choose for it to be! Last week, I finished shooting the last episode of ‘Sugar ‘n Spice’ which will be airing on DSTv’s Home Channel on the 29th June. The show took over three months to shoot and we have had many fabulous but long days on set…early morning kick offs and late nights! I am pinching myself…still thinking of the days when I promised myself I would get my very own show! Stay tuned for more details! 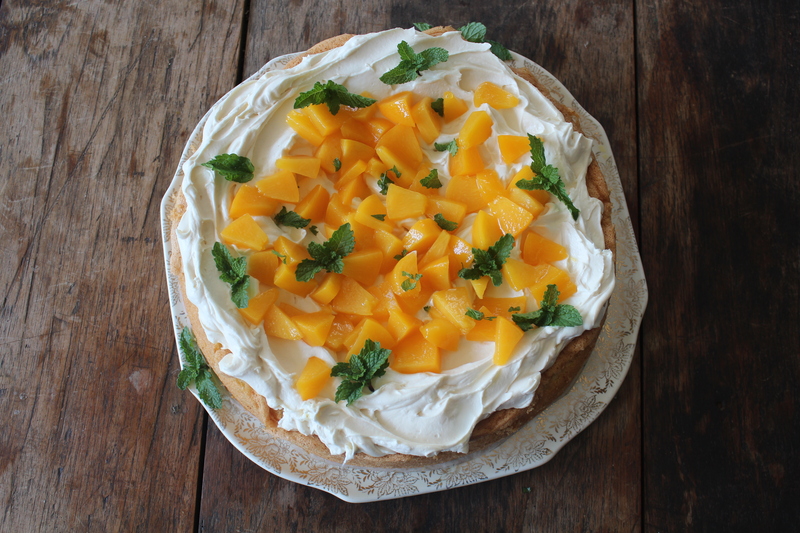 This cake reminds me so much of my days in Durban and when life is a peach, I have to celebrate. When I was a kid, our trusted Defy oven would blow a fuse and we would be left without my mom’s famous cakes for months. Tinned peaches were always on standby when we were cash flush that is…they were served with chilled dessert cream and it was simply delicious. I love the distinct flavour of dessert cream and my kids think that it is a real treat when I haul out a large tin of peaches! 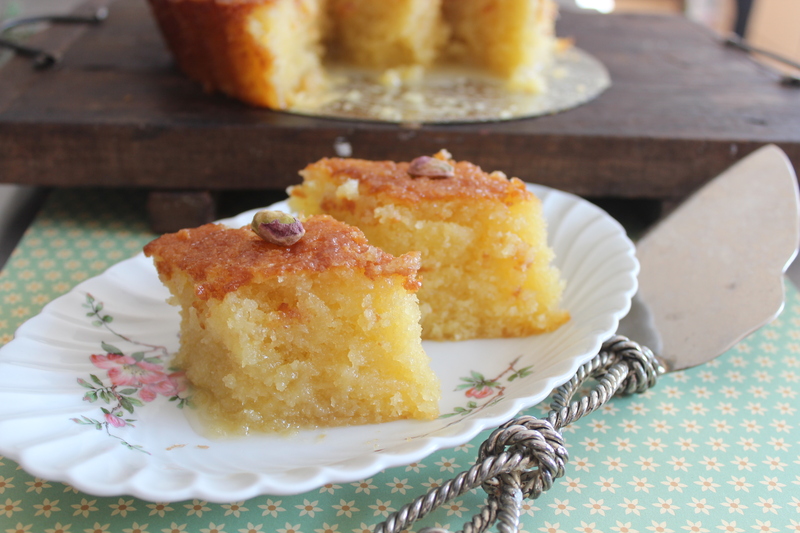 I made up this recipe which takes me back in time and I hope you enjoy it! A light sponge cake topped with luscious whipped cream and syrup soaked peaches! 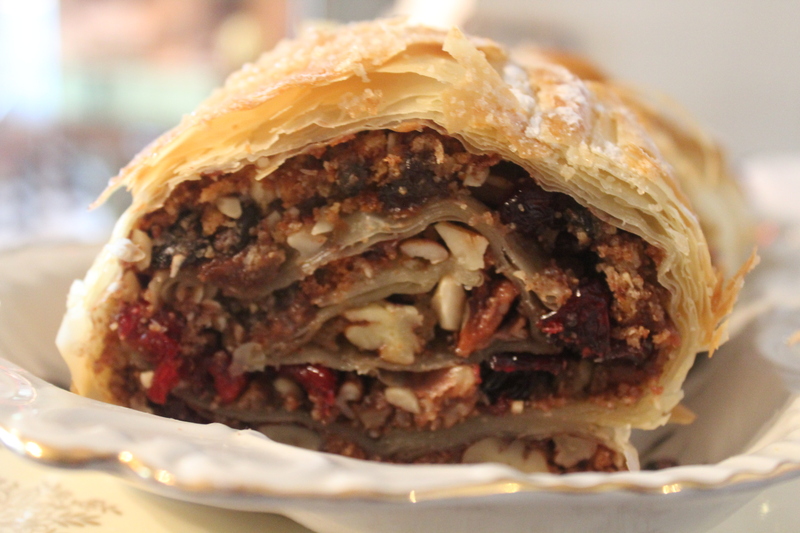 It might even be the perfect dessert making an appearance for Father’s Day on Sunday. I found a way of working around the sub standard fresh cream that just flops or won’t whip up successfully. Pick up a tub of Woolies or Weleda Double Thick Cream…you cant whip it on it’s own because it is too thick but add fresh cream or Nestle dessert cream to create a decadent topping! Grease and line 1 x 10 inch round cake tin. Beat the eggs in an electric mixer and gradually add sugar. Continue beating until thick and creamy – the mixture should leave a trail on the surface for 3 seconds. Fold the flour, baking powder and salt into the egg mixture. Add the water and oil, fold mixture again. Pour the batter into the prepared cake tin. Bake for 25 – 30 minutes or until a skewer comes out clean when inserted. Turn the cake out onto a wire rack and leave to cool. Place the double thick cream, dessert cream, sugar and vanilla essence into a mixing bowl. Whip until the cream thickens. Scoop the cream onto the top of the cake and use a spatula to make little peaks. Drain the peaches and discard the syrup. 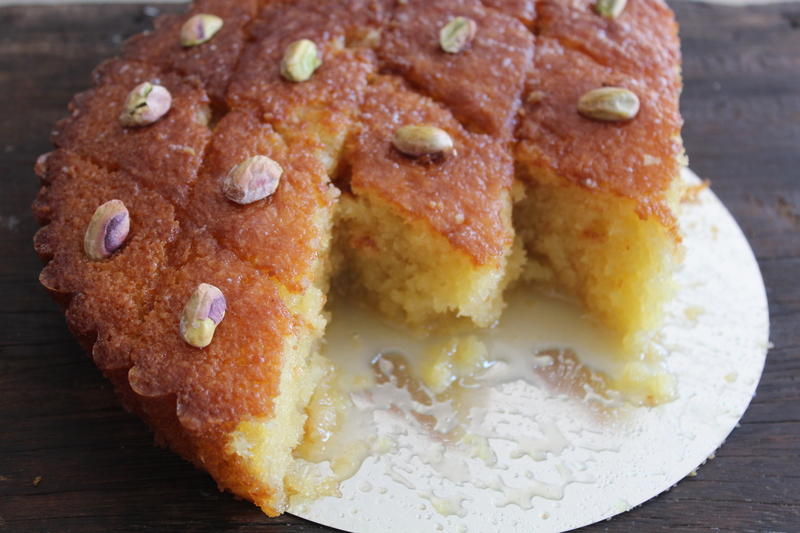 Chop the peach slices into little pieces and sprinkle over the cake. Make sure the mixing bowl is oil and grease free before whisking the eggs – oil prevents the eggs from incorporating air. Sorry is…such a sorry word! Is it just me or does the word sorry irritate anyone else? My thoughts and feelings percolate over time. This is not something new or a revelation of sorts and no, I haven’t had my heart-broken over the weekend…the word just irritates me! I can’t remember when it first struck me. Perhaps it was when my kids were little and bashing each other in a fight over a toy but I can still remember my son, Rushil, saying, ‘Sorry doesn’t even help!’ Over the past few years and somewhere in the midst of my latest ugly divorce, the dreadful word ‘sorry’ has been thrown carelessly into life changing conversations. Sometimes ‘Sorry’ comes only after years of someone forcing you to accept that an apology wasn’t necessary and by then, it is too late. Sorry isn’t enough…the word has made the world a worse place to live in. People have become careless with those most dear to them. People take chances knowing that when the cracks appear all they need to do is say sorry. Think back to being a child at school and playing with your friends…if you hurt or wronged anyone on the playground, we apologized by saying, ‘Sorry’…how many times did you say it without real emotion, regret and remorse? It has always been a mindless almost insincere response. Human beings are flawed….we all are and mistakes are a part of life and us growing emotionally. In this modern tech savvy world we live in, is it not possible that we have become emotionally unintelligent? Whether you are ill, being cheated on, just lost your job or experienced some sort of tragedy…it’s met with the same generic response, ‘I am sorry!’ How can such a small word possibly become the ‘one size fits all’ plaster for life’s wounds, whatever they might be? I was in a relationship once and my partner dated his ex girlfriend…he said, ‘It was no big deal’. If it was no big deal, why was it not mentioned when I made him dinner the next evening or when he chatted to me for hours the next day? Why did he actually do it? He took the chance and me for granted is the short answer thinking that all he had to do is say, ‘Sorry’ and that would come only if I found out, of course! Well, he didn’t anticipate that it would not be enough to fill in the cracks it left in the relationship….and the one thing about cracks is that they often expand and distort our feelings. My question is was he really sorry or sorry that I found out? Over the last while, I have had my share of generic sorries…but it’s taught me a lesson too. I would like to share my advice, if I may that is…I have been thinking, agonizing over the apologies I have not accepted and going forward ask you to live your life after erasing the word ‘Sorry’ from your vocabulary. Imagine making decisions and considering the people around you knowing that if you messed up, sorry would not be an option. I know that this would not erase any chance of making mistakes but we have become careless….maybe it would get us to think for a moment about everything that is precious and taken for granted. When we are wrong, we have to work harder than just an apology…we have to work harder than ‘Sorry’ to find a remedy, support the person we are apologizing to and put the ‘no big deal’ mentality aside! ‘Sorry’ is not an apology…it’s a word and it has no magical powers! Sorry is a sorry word….it is one of the most useless words in the dictionary. I have yet to write a blog about my carelessness and the things that I have been sorry about and apologies I’ve made….coming soon! It’s been cold over the past few days and all I want to do is tuck into some comfort food. It could be the weather but my guess is that my thoughts have also been keeping me busy and craving the comfort of Wintery bakes…I am endlessly entertained in my own company…with some comfort food of course! 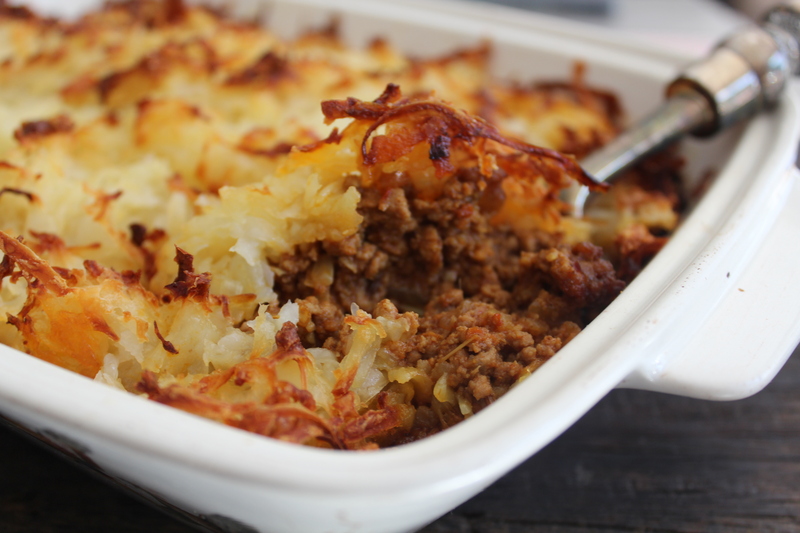 Here is a recipe for a deliciously spicy lamb rosti bake! I love a traditional Cottage Pie but with the weather playing up, I spiced this recipe up along the lines of Keema Masala or Curried Mince. It is delicious, quick to prepare and comforting! I used the spices from my Curry Me Home range and at first glance it looks like there is lots of red chilli…keep in mind that lamb and beef ‘hold’ a lot more chilli and it is the base spice of the dish. Mince tends to often be flavorless and bland so you have to spice it up a fair bit! Fry the cinnamon stick and bay leaf until fragrant, add the cumin seeds. When the seeds start to splutter, add the onion and salt. Salute the onion until light golden. Add the crushed ginger and garlic and fry for a few seconds. Add the red chilli powder and warm through for 3 – 5 seconds. Stir the lamb mince into the red chilli and fry until it changes colour. Add the ground coriander, garam masala and turmeric. Stir for a few minutes and add the tomatoes. Simmer until the tomatoes soften. Place the lamb mince into a casserole dish. Peel the potatoes and grate them over the mince. Melt the butter and pour it over the potatoes. Bake the lamb in the oven at 180 degrees celsius until the potatoes are golden brown which would take about 35 -45 minutes.